The New Show Will Be…. All Souls Dramatic Club are proud to announce the legendary tale of ‘Peter Pan’ will be flying in to The Atkinson Theatre in January 2016. Earlier this year, Snow White was performed to over 4,000 people receiving 5 star reviews from audience members, local press and the National Operatic and Dramatic Association. Work has now begun on creating an original script featuring the familiar elements of this classic tale along with the modern panto twist audiences have come to expect from this group. Auditions are set to take place later on in the year as well as further planning and preparations to make this show the most memorable pantomime Southport families have ever seen. 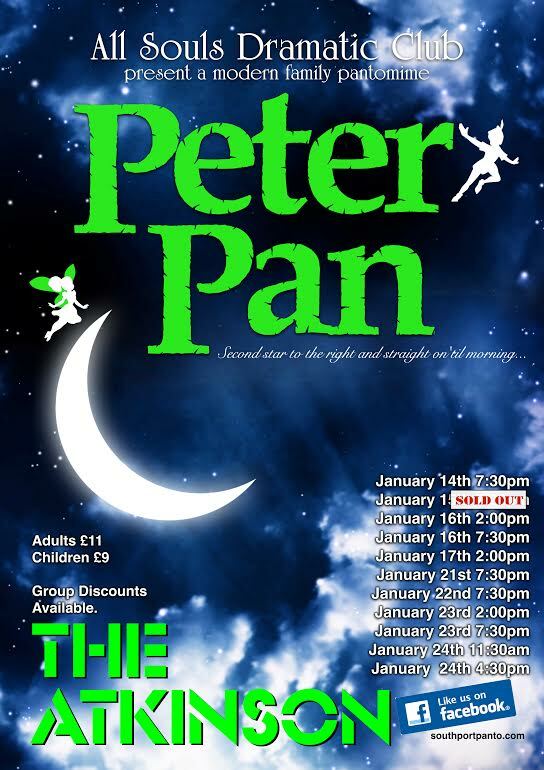 Tickets are on sale now from The Atkinson Box Office on Lord Street for ‘Peter Pan’ which will take place between January 14 and 24, 2016. Book online at theatkinson.co.uk, or call Box Office on 01704 533333. As always, All Souls are always on the lookout for performing and non-performing members, if you are interested in getting involved you can contact the club by sending them a message on the All Souls Dramatic Club Facebook page . ← All Souls Dramatic Club – The Best Panto In The Region – And that’s official!